The activity was well organized with 66 participants from Thai Nguyen University of Sciences, Thai Nguyen University of Education, Hanoi University of Education, Hanoi University of Science, Hanoi Institute of Mathematics, Hanoi Pedagogical University 2, Ho Chi Minh University of Science, Ho Chi Minh University of Pedagogy, Hung Vuong University, Vinh University, Ton Duc Thang University, Tra Vinh University, Dong Nai University, Sai Gon University of Technology, Da Lat University, Yamaguchi University, Nihon University, Chiba University and Meiji University. There were 55 Vietnamese participants and 11 from Japan. Five hosting Institutes and Universities were: Hanoi Institute of Mathematics; International Mathematical Union – Committee for Women in Mathematics; Meiji University; Thai Nguyen University of Sciences; and Ton Duc Thang University. There were 19 Vietnamese and Japanese female participants. The expenses (including travels and local expenses) for 10 female participants from the North of Vietnam (Le Thi Thanh Nhan, Nguyen Thi Dung, Nguyen Thi Hong Loan, Nguyen Thu Hang, Ngo Thi Ngoan, Luu Phuong Thao, Nguyen Thanh Tam, Tran Do Minh Chau, Hoang Thi Yen, Nguyen Kieu Nga) as well as the expenses for the Section “How to support female mathematicians” were supported by International Mathematical Union – Committee for Women in Mathematics with the total amount of 2700 euros. During the event, there were two series of lectures. The first series of lectures on “Characteristic p>0 methods in Commutative Algebra” were given by Prof. K. Yoshida (Nihon University, Japan). The second ones on “Direct Summand Conjecture” were given by Prof. Shimomoto (Nihon University). These lectures contained a lot of interesting and updated results. Especially, Direct Summand Conjecture is one of the most important topics in Commutative Algebra, which have been solved recently. Along with the lectures, there were 14 scientific talks about several topics which are drawing interest at the moment. 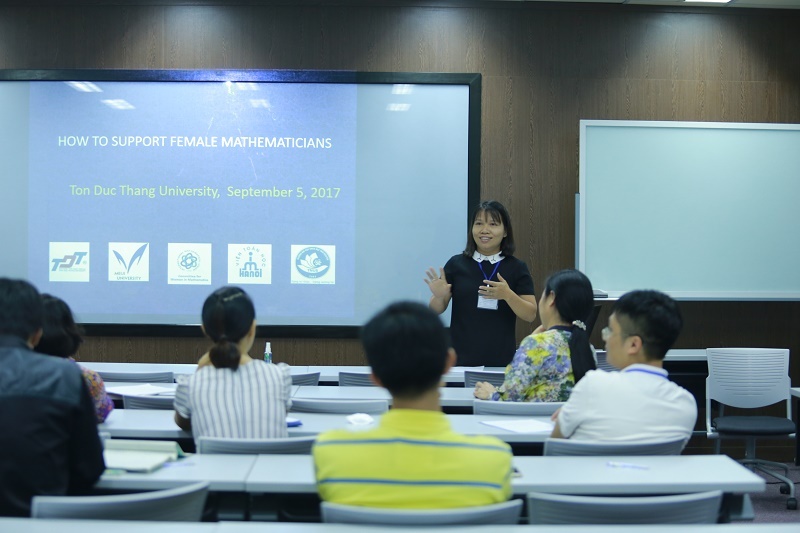 Nine of the talks were presented by male mathematicians, and other 5 lectures and scientific talks were presented by female mathematicians. There was an interesting section (chaired by Prof. 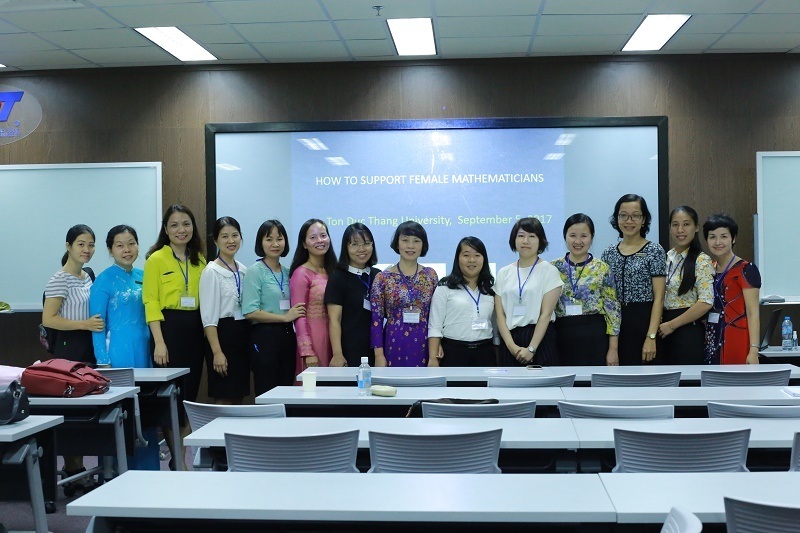 Le Thi Thanh Nhan) on the evening of 5th September 2017 for participants to discuss about the topic “How to support female Mathematicians”. In the discussion, participants talked about the disadvantages and the advantages for women learning and researching; the differences between women and men studying mathematics; how should organizations provide support for women to promote and contribute more in science... A number of remarkable ideas were raised by Prof. Nguyen Thi Dung, Prof. Nguyen Thi Hong Loan, PhD student Luu Phuong Thao, PhD student Nguyen Thu Hang, etc. Especially, the idea given by Prof. Shimomoto (from Nihon University Japan) encouraged our female mathematicians so much “Women or men should not be discriminated in mathematics. Because, mathematics itself and all sciences do not distinguish between women and men. However, it is more difficult for women when they study and research mathematics because they have a lot of responsibilities in their life. In Japan, there are a few female mathematicians. So, I admire Vietnamese female mathematicians. I know that, in Vietnam, despite of difficulties, female mathematicians have many efforts and they get better results in their research”.